From focusing, to goal setting, to self-discipline, to confidence – your child is going to emerge from this program changed for the better. As a parent of 2 boys myself I know YOU WILL BE AMAZED at what YOUR CHILD WILL ACCOMPLISH! Many children are nowadays unable to properly concentrate due to many daily distractions. 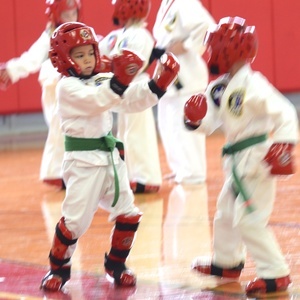 In our martial arts program your child will work on one thing at a time, learning how to refocus again. When it comes to bullies, kids in martial arts don't back down. They have the courage to look a bully in the eyes, and stand their ground. This is what nearly always happens - the bully gets scared and backs down! It happens 9 times out of 10. And for the 1 time out of 10 the bully doesn't back down – your child has the tools to defend her or himself. And if necessary, he'll be able to get away, and seek out an authority figure. Most confrontations can be talked through. Occasionally, however, words aren't enough. For either situation your child will be prepared. No one will be able to hurt your child, or take anything away from them. Your child will be determined to succeed – from day 1 in martial arts your child sets goals, and accomplishes them. The more and more they do this the more ambitious they becomes. Eventually your child learns to set higher goals and they learn to go after them with everything they got. They learn that fulfillment and respect are earned through completing challenges. Because of this, kids who go through martial arts are much more likely to succeed later in life as well. A recent study showed that 63% of black belts become college graduates! They then go on to live wonderful, fulfilling lives. And then they pass these principles onto their own children. Click the image above to learn more about our awesome Martial Arts Birthday Party packages.